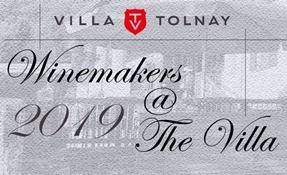 The winery Villa Tolnay Winery will hold the "Winemakers@The Villa" event for the first time in its history on Friday 5th and Saturday 6th April 2019. This event will be held annually and will be expanded in the future. Its purpose is to establish, develop and tighten the contact, link and exchange of know-how between top winemakers from western Europe and from the Pannonian region (Slovakia, Hungary and Romania). At the same time, the foreign colleagues and their wines are to be opened and brought closer to the Hungarian wine-lover's audience. • Viticulture: conventional - organic - biodynamic? • Effects of the weather change, how do we adjust to it? • To which wine does the future belong? The ear at the market or "detached"? On Saturday, April 6th, from 11am to 3pm, the "Winemakers@The Villa" tasting will take place in the newly completed Villa Tolnay Winery. Each of the winemakers brings his own wines to the event, including his base wines and also his top products. The tasting is open to all wine lovers and wine enthusiasts in Hungary, but there is a pre-registration requirement according to the motto; first comes, first served. The number of participants is limited to a maximum of 40 persons, because we want to give every visitor the opportunity to get to know the producers personally and to have a chat with them. On Saturday, the Hungarian press will also be invited personally. The participation amounts to HUF 14.900.- per person. You can find the registration link here via the event registration webpage of Kóstolom. its foreign colleagues and the Hungarian wine lovers to our event. With the best regards and well-being!